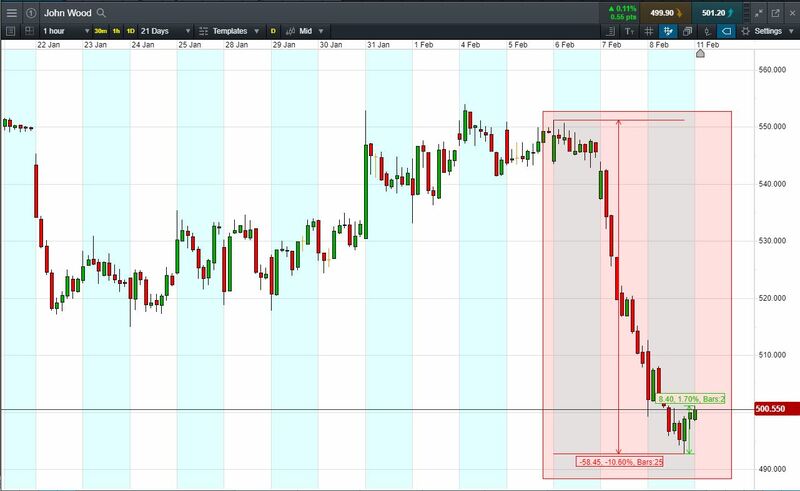 Will John Wood continue falling, or will it rise again back to 551p last week’s highs? Shares already bounced +1.7% from lows, +0.4% today. 28 Jan: Oil services group sold $28m interest in JVs to dispose of non-core assets. Now trades 500p (at time of writing). Shares -17.7% from 2019 highs; +1.4% from 2019 lows; -0.5% year-to-date. Can the stock recover to recent highs? Let’s say you feel that the stock is a bargain and you think could bounce back towards recent high of 551p. You decide to buy exposure to £10,000 worth of John Wood using a CFD, at the current price of 500p. To do this, you need £2,000. Let’s assume John Wood recovers back to 551p last week’s highs (+10.2%). Your profit would be £1020, from your initial investment of £2,000. Conversely, let’s assume you open the above position, and place a stop-loss at 4% from the current price. John Wood falls 4% and hits your stop-loss. Your loss would be £400.